“What’s for dinner?” My mom would sometimes get so frustrated when we asked this question. Figuring out what to make for dinner every single day is hard. So here is a list of things I feed my kids- mostly the toddler because the baby is just starting solids. Some of these meals are extremely successful (I have marked them with an asterisk *) while others are not. My rule is that I don’t give a different option unless I make something that is truly ‘out there’ but the option is always something healthier than the original. I will continue to update this list, so if you bookmark this page and come back to it, you’ll find new ideas. 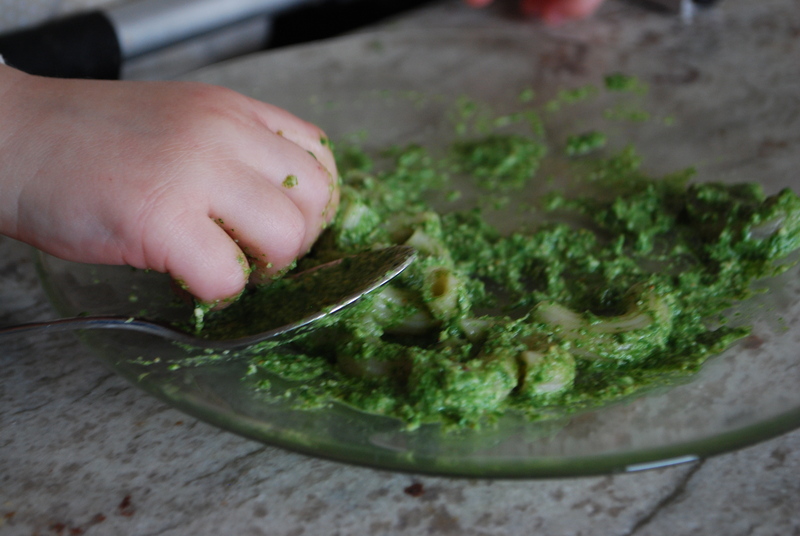 Little hands like this Swiss chard pesto! Do you have any more ideas? I’ll add them to this list!